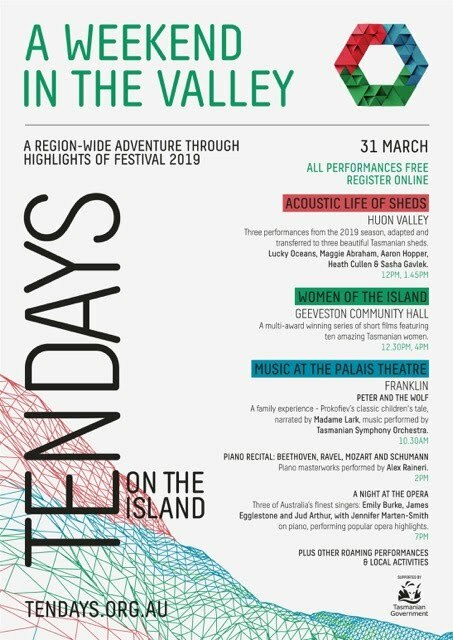 'Ten Days on the Island is organizing several FREE events in the Huon Valley on Sunday 31 March, as part of ‘A Weekend in the Valley’ festivities. 7.00pm A Night at the Opera – 3 of Australia’s finest singers perform popular opera highlights. See attached programme for more details (https://tinyurl.com/y3w64emw). NOTE – these concerts are free to attend, however due to limited seating we require that you register beforehand at Tendays.org.au/a-weekend-in-the-valley/. Refreshments will be available, and a bar open from 1.30pm. Palais doors open 30 minutes before each performance.